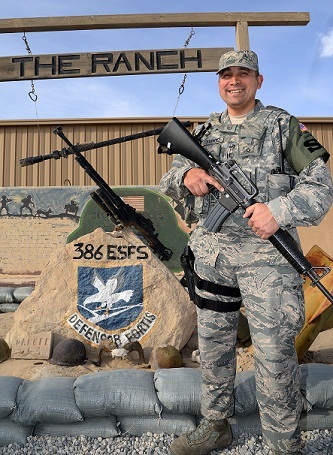 My name is Roger and I am recently medically retired from the Army on Sept 29 2014. 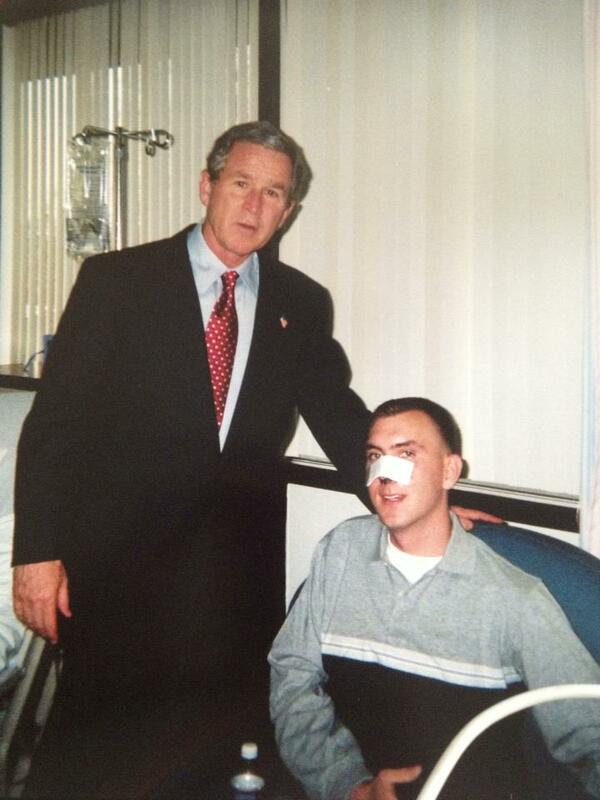 I was severely injured in Eastern, Afghanistan on 23 April 2011 while conducting a night mission leading my Platoon. My Platoon was ambushed and we took heavy casualties and KIA. Being the Platoon Sergeant and having the Medic with me I had seen numerous Soldiers down in front of the enemy position during the intense firefight that was no more than 15 meters apart. 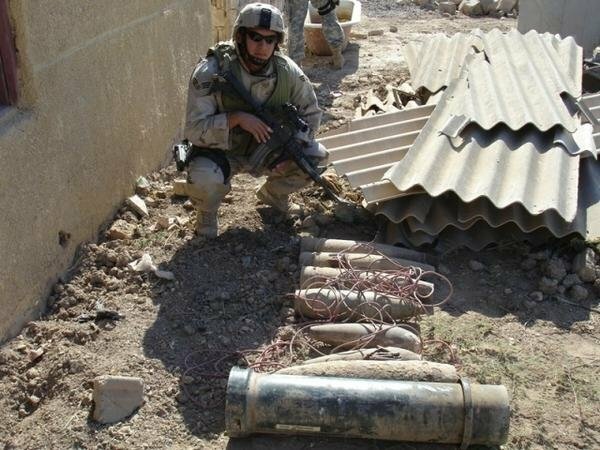 Without hesitation myself and my Medic rushed into enemy fire to try and retrieve our men and while only a few meters away I was blown up by a enemy hand grenade. I have been on the road to recovery mentally and physically but it is hard. I have attempted suicide several times and have been impatient trying to live with the guilt of losing my men. I live in isolation and don't get out much. I just thought maybe going to a Tennessee Titans game with my neighbor would be good for a change. We are both big fans of the Titans. He has really helped me with supporting me around the yard, talks about my lose, since he is a senior critical care paramedic and knows what I'm talking about and overall a good friend. 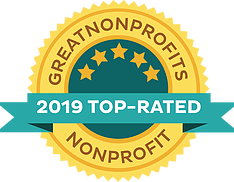 Thank you to anyone reading this. We all are inspiration to each other no matter what we do. 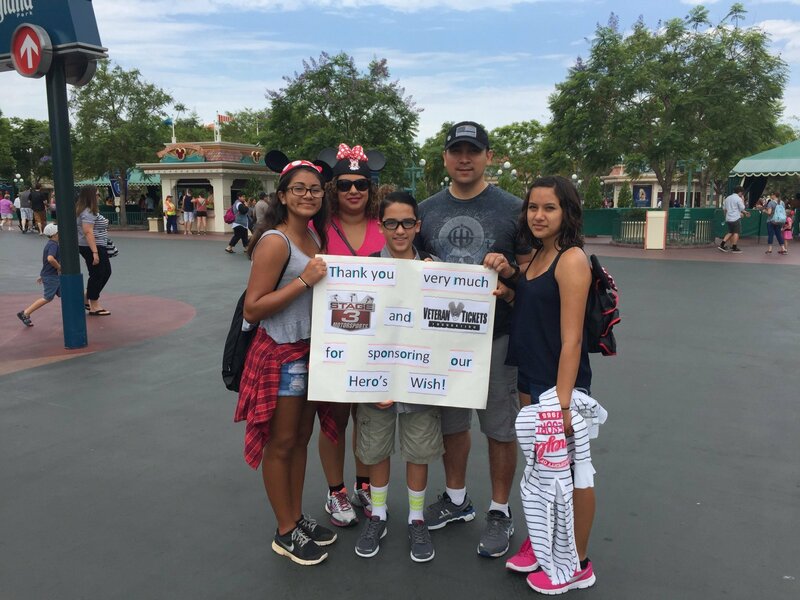 I would like to personally thank all of the great people who have donated to my Hero's Wish. 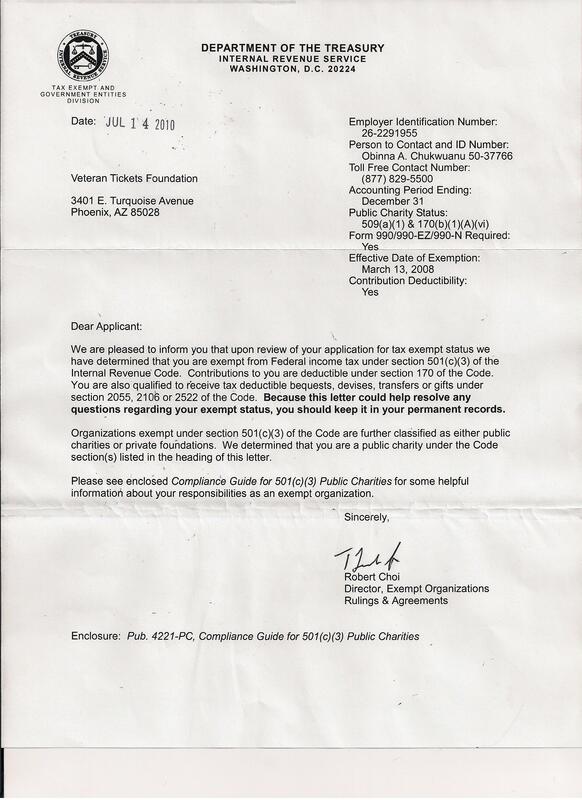 It is because of people like you and VET TIX that keeps us knowing that we are not forgotten. This event was the first one I have been to since being severely injured and losing my men on 22 April 2011. I had one of the best times of my life. I would like for the special people who have donated and VET TIX to know that you have a special place in my heart. My spirit has been lifted, I realized that life doesn't have to be stuck in the house isolated. All of you were apart of this and hopefully it touches your hearts as much as it touched mine. Thank you and may GOD bless you all. 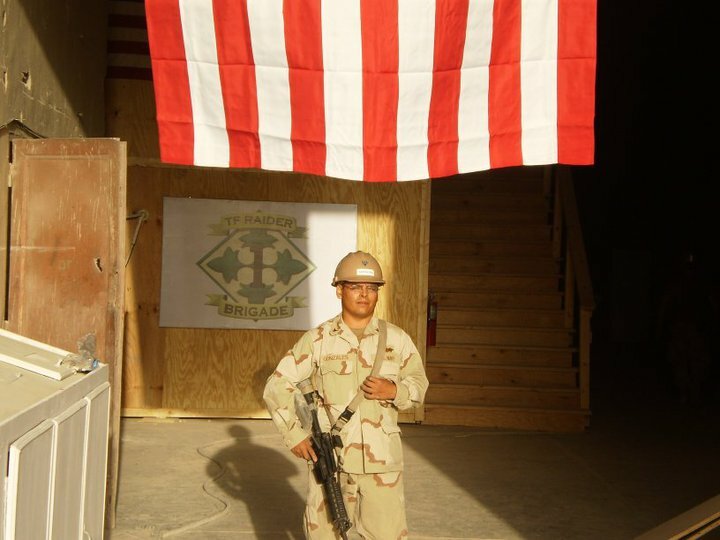 My name is SPC Amado R. Punto Jr. I am currently deployed in Romania. 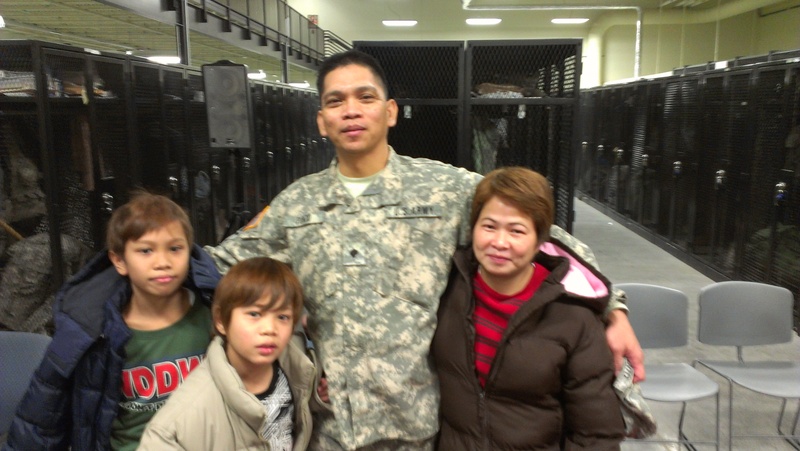 From Aug 2011 to Sept 2012 I had my first deployment and spent time with my family in the Philippines on Apr 2012 during R & R. I went back to Fort Riley on Aug. 2012 and was reassigned to my current unit 165th MCT , 541st Combat Sustainment Support battalion. Before the end of year 2013, my family visas were finally approved and they came to states on Dec 30 2013. After 45 days of being together again I got deployed to Romania from 15 February 2014 until present. My wife and kids were only in the states for a month before I was deployed. My wife, my two sons ages 10 and 13 and daughter 17 are staying now in Oxnard , California. Their only wish at this time is for me to give them a time for family bonding after deployment and they want it in Disneyland in Anaheim. Their wish since their childhood might come through with your support and will really appreciate it with all my heart. Hello, My name is SPC Timothy Sexton. 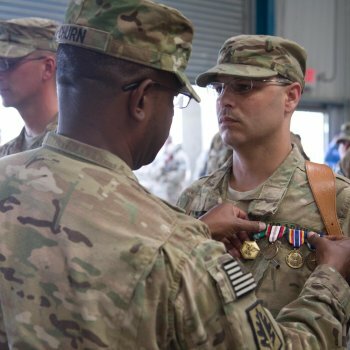 I have just recently returned home from my first combat deployment to Afghanistan. 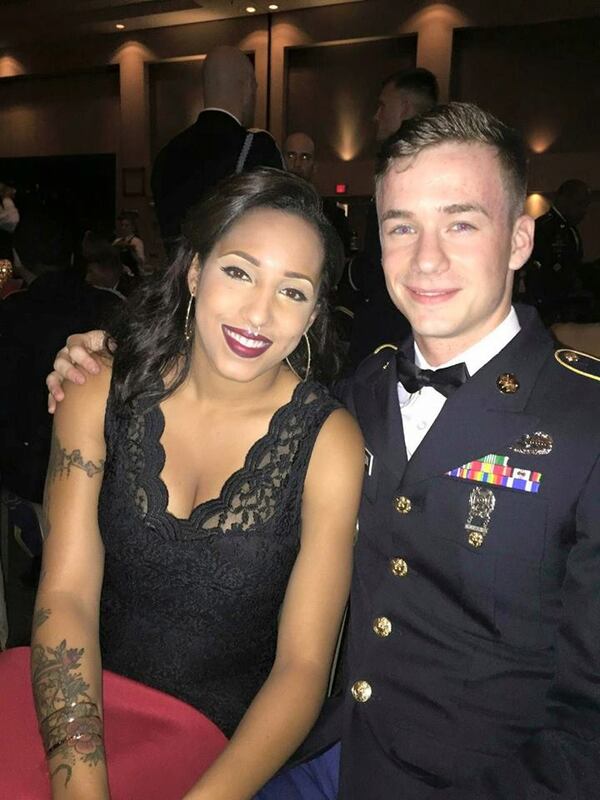 I am married to my beautiful wife Teesha. While I was gone, 2 of my wife's many wishes included coming home safely to her, and to take her to a Cowboys game. I have fulfilled one of those wishes, and intend to fulfill the second. I wish to attend the Atlanta Falcons @ Dallas Cowboys game on September 27th, 2015. I grew up a Falcons fan, and she grew up a Cowboys fan. Fortunately they are playing each other in the state that we reside! So we are both very excited to get a chance to see them both. My name is SPC Sisk. I have a wife and 3 amazing kids that are 11,9, and 5. They are my heart and soul. I haven't got to see them much in the last 3 years due to training and deployments and would love to take them to Disney. I always wanted to go there myself when I was little but could never afford it. I think it would be some much needed bonding time after this deployment. My wish is for 5 4-day park hopper passes for Disney World. I would like to take my wife and children to Disneyland. We had to purchase a car when I got home from deployment because the car we had we didn't trust to drive across country with a trailer, doing this left us with very little money after the down payment and trip across country and moving into our new apartment. Now we live month to month paycheck to paycheck. My daughters both 12 and 4 have been begging to go to Disneyland since I got home! I have a wife and 3 gorgeous children, 2 girls and a boy. Eve is 12, Leigha 4 and Lucas 1! I was hoping to get 5 tickets so that my mother could join us at Disneyland! She hasn't been able to spend much time with the kids because my wife moved back to MI while I was deployed to spend time with her family. My name is SGT Christopher E Waite. I am currently on my third deployment and my second one in 3 years. Both have been to Afghanistan. The last 3 years have been hard on myself and my family due to the time that I have had to spend away from them serving our great country. 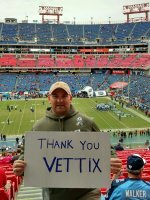 With this deployment coming to an end I can not think of a better way to share an experience with them then through a generous donation from Vet Tix. I have always wanted to experience the Brick Yard 400 in Indianapolis, IN even though I live close to the track I have never had the opportunity to watch a race live and in person. I know it would be an experience of a life time, to feel the rumble of the engine of the Nascars as they scream by. Thank you for your time and consideration. Thank you so much to Stage 3 Motorsports for the tickets. My family and I had an amazing time with phenomenal seats near the Start Finish Line. 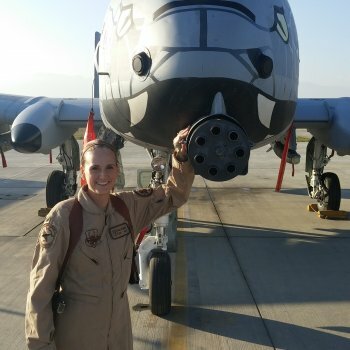 My name is SSgt Kelly Goodman. My kids are HUGE Michael Jackson fans, they love his music so much, even my girls would move around in my belly when I played him around the house. My son knows all his songs. It's just a drive from us and it can be a vacation we can have that's affordable and not over the top. I missed out on Halloween, Thanksgiving, Christmas, their 5th birthday, my anniversary, New years, Valentine's, St Patrick's, and soon to be Easter. My kids haven't been apart from me this long and my kids have actually had a harder time than I thought. It's dad who is usually gone for work (he's military too). We are looking at going to Vegas July 22-26 so any show during that time would be amazing. I just want to thank these kids for their sacrifice, and have a memorable time with them since I missed out on so much, and thank my husband for taking on the task of mom and dad and shuttling them everywhere. 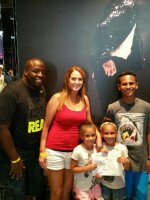 We try to bond with our kids through things they love and have a passion for and Michael Jackson's music and talent, and the acrobatics from this show are things our kids love, to see their faces light up with joy and excitement, the freedom they have to do that, reminds me why I love my job and do what I do for them. I'm requesting 5 tickets because it's me, my husband, our 14 year old son, and our twin 5 year old daughters. Thank you for reading our wish. Thank you so much to Stage 3 Motorsports, Vet Tix and the other donors who made this possible. 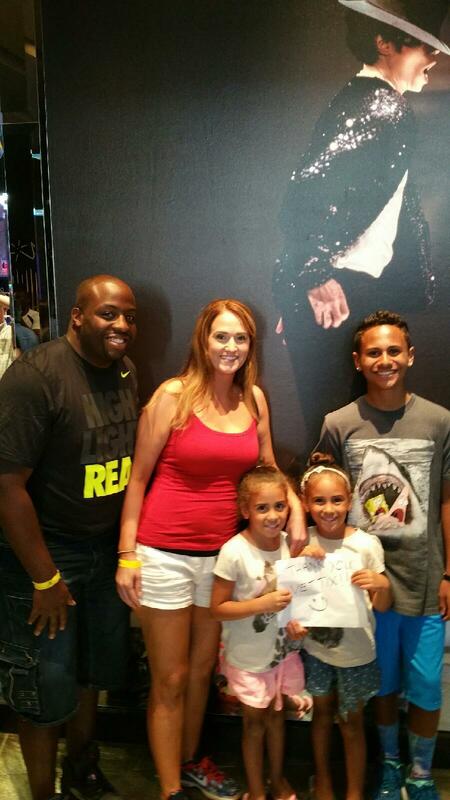 Seeing Michael Jackson ONE was awesome! Our kids LOVED the music, the acrobats, and the dancing. Seeing their faces light up with smiles and happiness the whole show was rewarding in itself! They even had a hologram of Michael towards the end, and it was a bittersweet realization that he really is gone and this was the closest thing we'd get to see him in concert. We're beyond blessed to have such amazing supporters of military like you guys. I'm forever grateful that I got to take my family somewhere as a thank you for their hard work and support during my deployment. Thank you guys so much! My name is LT. Timothy Thibault. I live near Boston Ma, and I have been on deployment for 5 months with another 4 months to go. I would like to bring my family to the event. My wife Elaine, two daughters Samantha (22) & Rebecca (16). I have been around auto racing for many years, building race cars, driving cars and even my daughter was racing when she was 9 years old. My wish is to take my family for the weekend at New Hampshire Motor Speedway. Nascar Modified Tour all star race on 7/17 & 7/18. Maybe even the Nascar Sprint cup on 7/19. Access to pit area would be awesome. I would love to throw the green flag for the race while in uniform! Have been around auto racing in New England since I was 10 years old. Thank you so much to Stage 3 Motorsport for your donation to make my wish come true. My family and I had a great time! We had some great relaxing time and enjoyed the races. Thank you for all you do for service members! It was a perfect experience! Thanks again. Thibault family. My name is Douglas Edds. 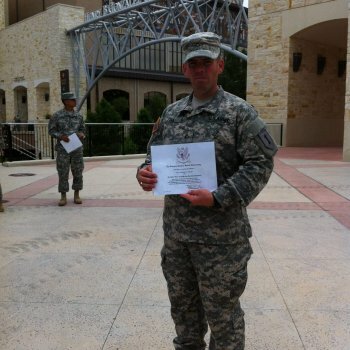 I separated from active duty back in 2012. 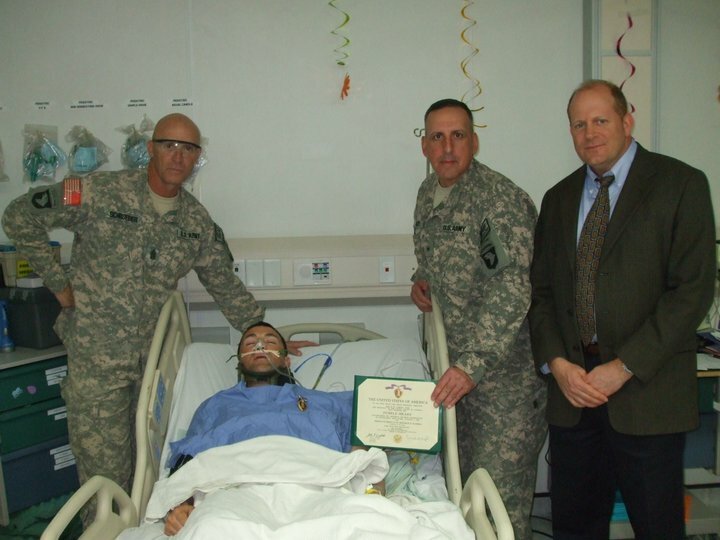 In September of 2011 on my last deployment I was blown up by a VBIED (truck packed with 1500 lbs of explosives) receiving the purple heart and being sent back to the united states medically. After I got out I had to start different treatments through the VA and haven't been able to truly get away and go on a vacation. So now that my health is stable we don't really have the money for a big vacation like this. 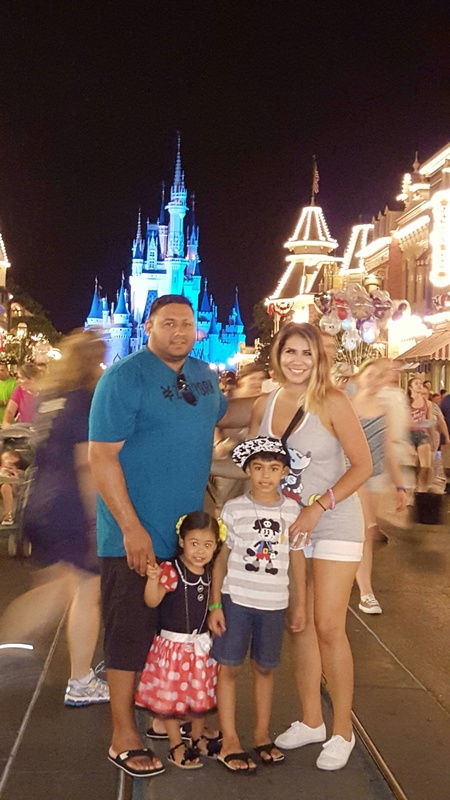 So it is my wish to take my wife and two kids to Disney World for a once in a lifetime experience. Thank you to everyone who had a part in sending me and my family to Disney World for the time of our lives. 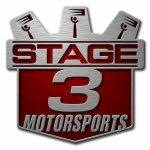 I wish to personally thank Stage 3 Motorsports for their generous donation in helping to make my wish a reality. It really couldn't have been a better vacation. It will definitely be memories that last a lifetime and I will never forget those that made this great time possible. So thank you from the bottom of our hearts. I am a an Iraqi Freedom veteran(2003). 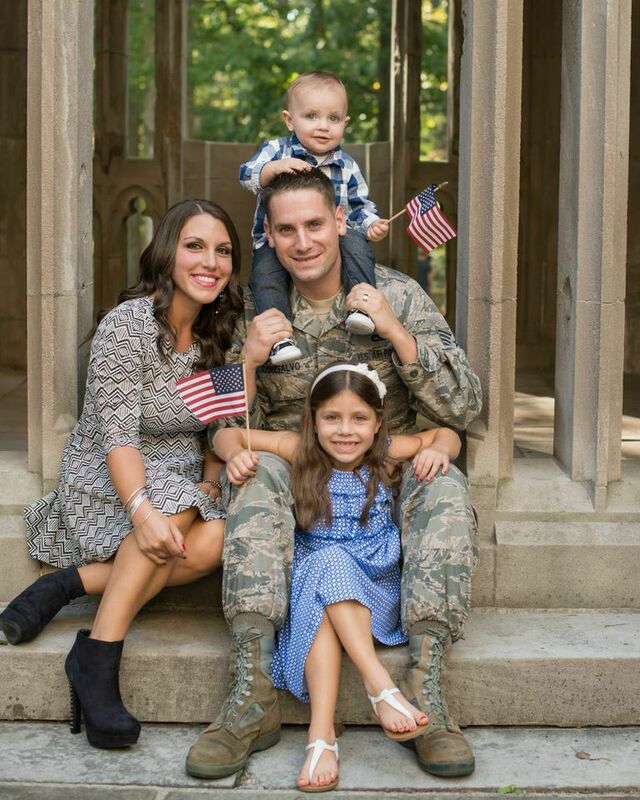 All I ever wanted after a life full of stress and constant selfless service to this beautiful country was a family. 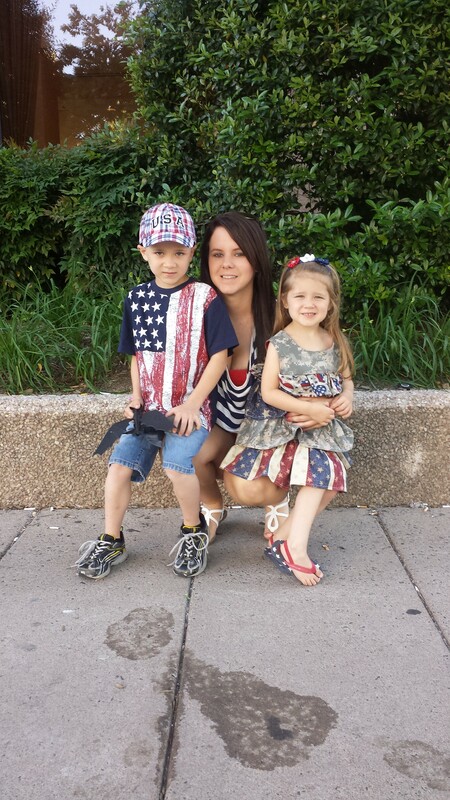 God has blessed me with a beautiful wife and two wonderful children. My son, Valentino(5) and daughter, Belicia(2) are very much a fan of Disney. I would wish to give them what would be their dream vacation. As a father, I would request this for them to see a smile on their faces. That in itself is worth all the sacrifices I have made. God bless America. 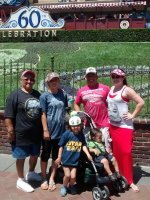 I would like to thank Stage 3 Motorsports, Vet Tix and all the donors for the opportunity to take my family on a dream vacation to Disney World. It truly is a place of miracles and memories. This vacation will be one that will be remembered for the rest of our lives. Thank you once again for being there and taking care of those who have served faithfully to this great country! My name is Sgt. Benjamin Wing. This year marks my 10th wedding anniversary and I'll be in Afghanistan during that time. I have 2 kids, and with this being my 10th wedding anniversary to my high school sweetheart (Tanya) as well as my 10th anniversary of service in the Army. I'm only out here for 2 months. I'll be getting back at the end of next month. Luke Bryan will be performing at Vanderbilt on July 11th and will be the perfect anniversary date. 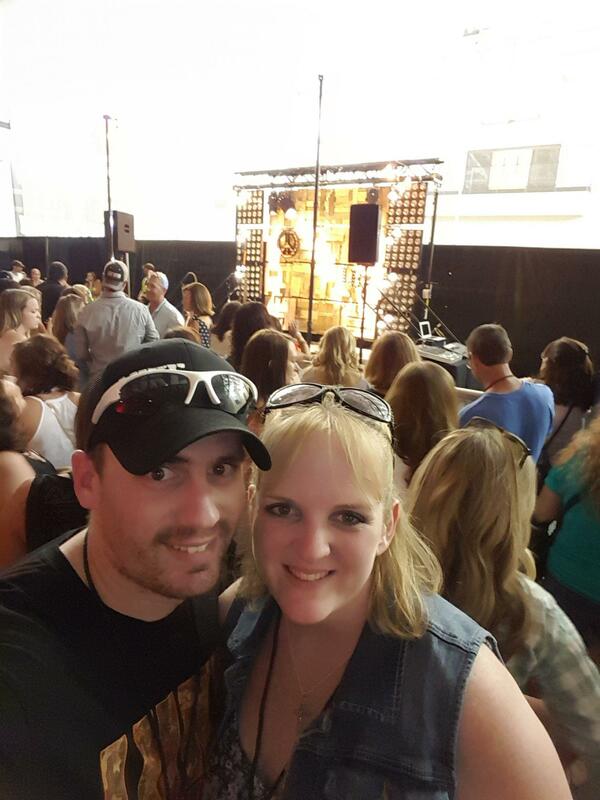 We had an awesome time and amazing 10th anniversary date at the concert. Thank you to Live Nation, donors, and Vet Tix for making this come together. 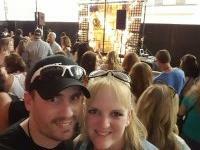 My wife and I especially loved the VIP performance by Luke Bryan in the VIP lounge. Thank you so much. 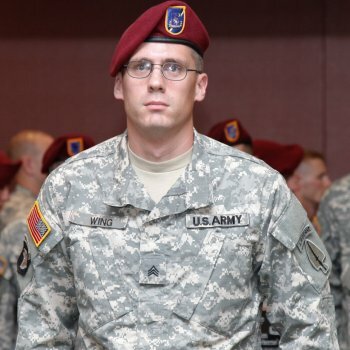 My name is Lara Smith, my husband SSG, Tyler J. Smith was KIA in Afghanistan April 3, 2012. We were high school sweethearts, and got married right out of high school at the ages of 17 and 18. We were married for 6 years before his passing and we have two beautiful children. Our son Wyatt is 7, and our daughter Carson is 4. 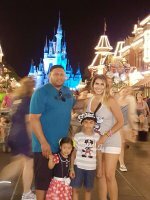 We always dreamed of taking our kids to Disney World since neither of us had ever been. Carson loves Cinderella and frequently talks about wanting to visit her castle and meet all the princesses. I would love to be able to take Wyatt and Carson to Disney World in FL. It would be a dream come true and a once in a lifetime opportunity. 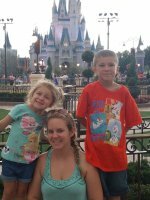 I am asking for 4 4-day passes to Disney World FL (for myself, Wyatt, Carson, and for a family member to help me with the kids.) Thank you and God Bless. 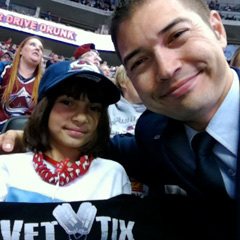 My 2 children and I want to say a big thank you to Vet Tix, and to all of the donors who helped make our wish come true. We had an amazing time at Disney World. My daughter Carson got to meet almost all of the princesses, and my son loved riding all of the rides. Without all of your help we would have never been able to go. It was such an amazing experience and I loved seeing the huge smiles on my kids faces. I can not possibly thank all of you enough. I am currently on my seventh deployment. 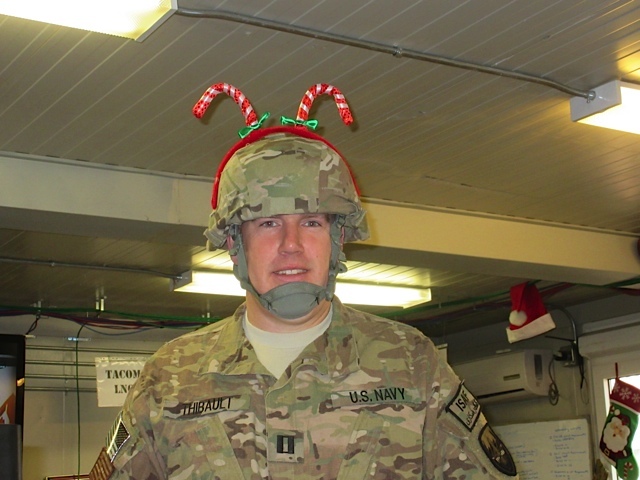 I have been deployed since October 2014 and missed all the birthdays and holidays with Maria, my wife of 19 years (20 in August)and my 15 and 14 year old daughters, Ana and Tori and my 13 year old son Santiago. 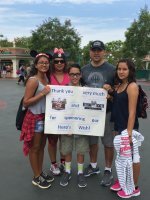 To be able to receive 4 three day Disneyland, CA Park Hopper passes would be a tremendous blessing and gift for my family. 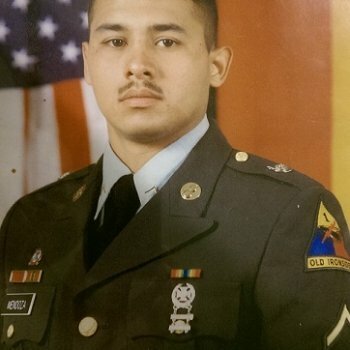 On 5 April 2015 I reached my 20 year anniversery in the service and it will be great to get back home and surprise them with a gift for all the support they have given me in allowing me to serve my country with honor. Thank you for reading and consideration in fulfilling this veterans wish. May God continue to bless America and those who defend and support her. 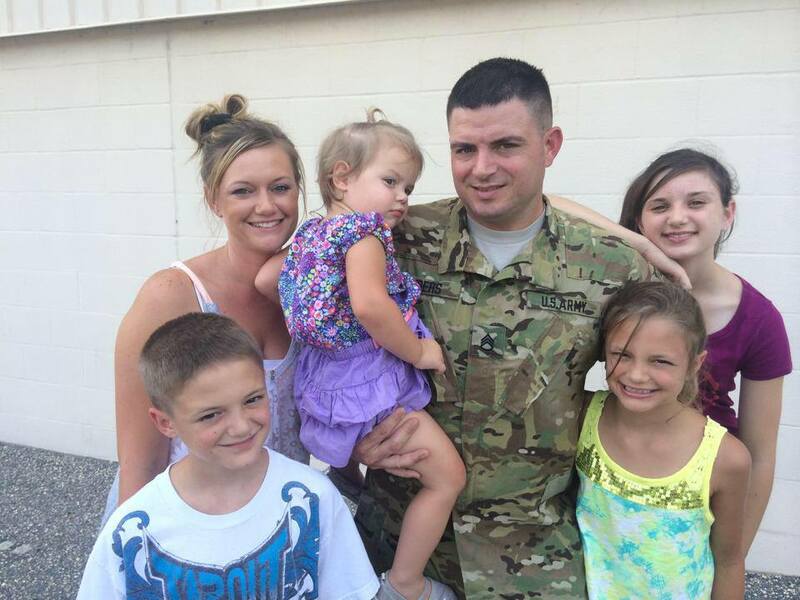 I am SSG Anders, I would love to take my family to Walt Disney World Orlando after I return from my current deployment. I have four awesome children with my beautiful wife whom I have been married to for 13 years. 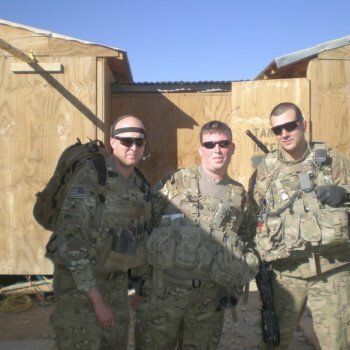 I have only got to spend 10 months in the states since 2009 and cannot wait to return from this deployment. The baby is 2 now and I have missed most of her life. I cannot wait to spend some time and get to know her. I would need 6 tickets due to having four children and myself and the wife. Thank you! Thank you all for your donations. 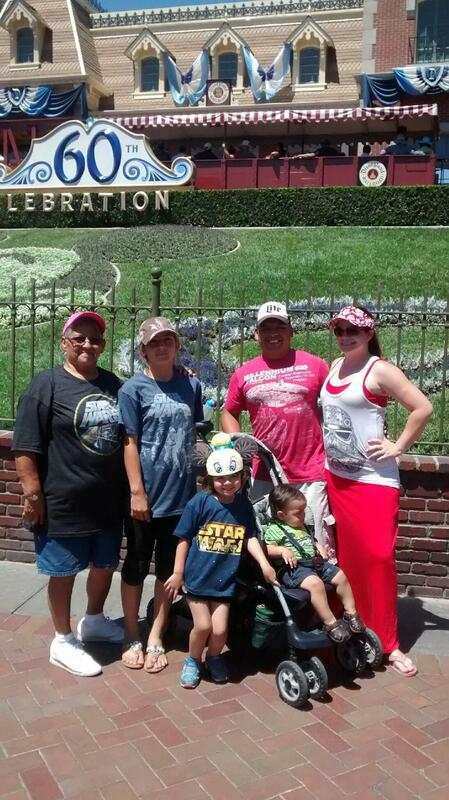 My family and I really enjoyed Disney! 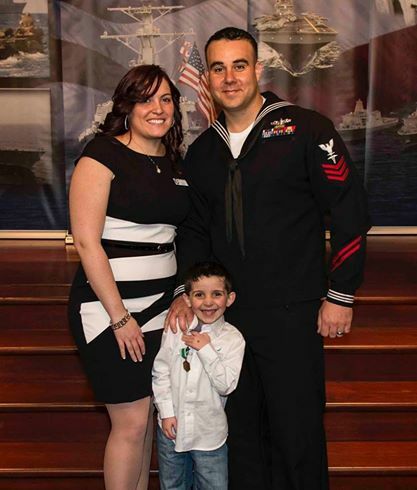 I just recently returned from a 5th Fleet deployment on a Naval Patrol Coastal Ship. 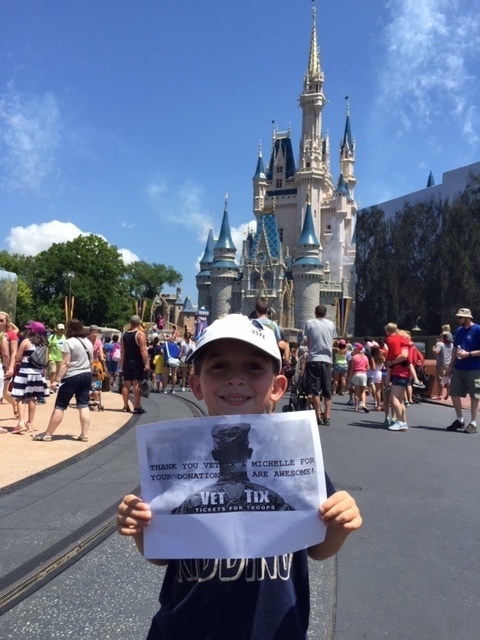 I have been promising my little guy for a few years now that we would take him to Disney World to meet Mickey and his other favorite characters. 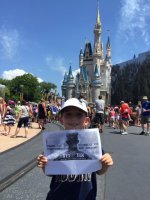 I would love to fulfill that promise and take my wife and 5 year old son to disney in Florida while on my post deployment leave. I have 30 days until I check into my next duty station and school. My window to go would be between 25Jan-06Feb 2015. 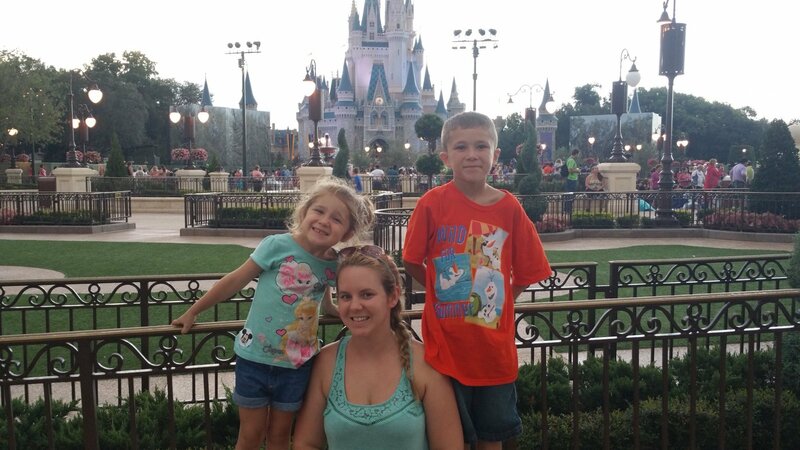 We were floored to have received three four day park hoppers for Disney Parks in Orlando, FL. The gesture was much more than expected from our original request of one day at Disney. 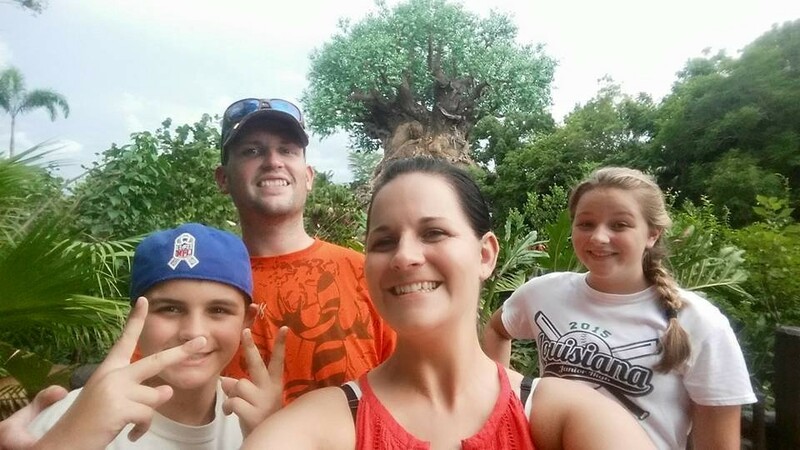 Michelle and Vet Tix made it possible to finally on our promise to take Connor to Disney Magic Kingdom and Animal Kingdom. He said it best when he said "Its the greatest day of my life". 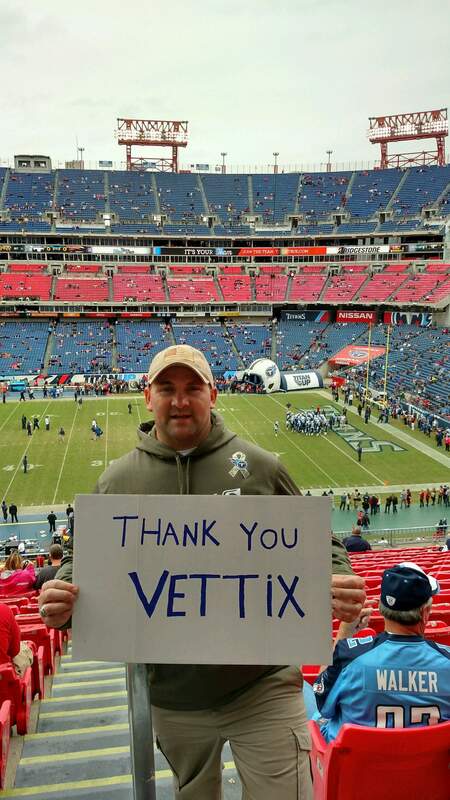 I really appreciate everything that Vet Tix does for our troops and for donors like Michelle for paying forward such a fulfilling experience. Thank you so much for making my Families Summer! My name is Daniel Acosta. 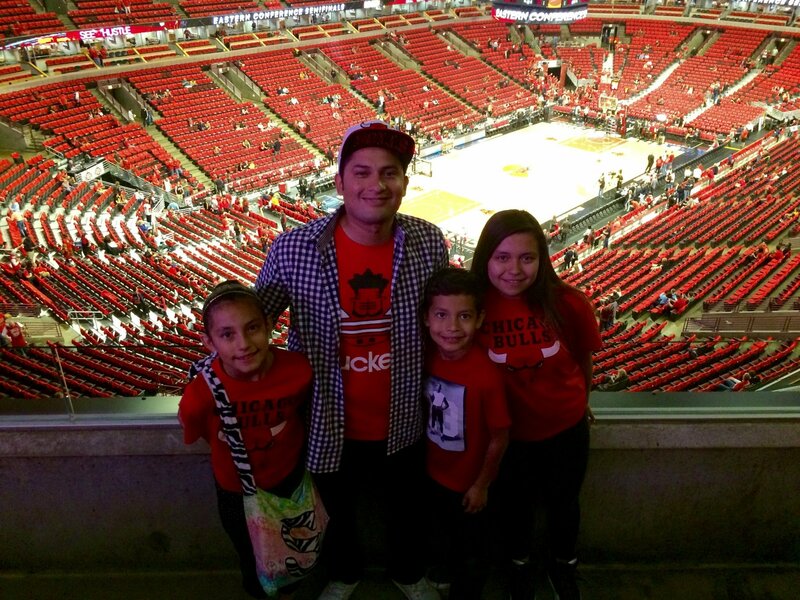 My Wish is to attend a Chicago Bulls playoffs game with my family. My children are huge Chicago Bulls fans and all play in an extracurricular basketball program. They had a chance to meet some of the players at a fan event this past winter and now are completely hooked on the team. It's been a plan to attend a game together but is usually too expensive. 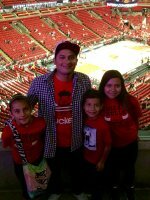 I feel that attending a Bulls game would been an amazing experience for my children and a great opportunity to have a family bonding moment. A special thank you to the Veteran Tickets Foundation and the generous donor of Chicago Bulls Playoff tickets! My children and I had a wonderful time and were able to witness one of the most exciting games of the 2015 playoffs. With all of us being avid Chicago Bulls fans, watching Derek Rose score the buzzer beating game winning shot is a memory that will last a lifetime. As a father, it was very special to watch my children full of excitement, cheering, laughing and happy! Thank you for all you do to support our veterans and their families. My name is Scott Gerber. 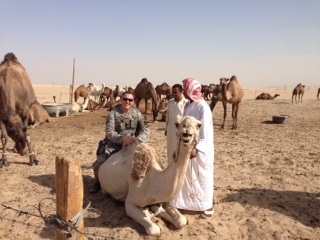 I am currently on my 5th deployment overseas and my 2nd time in Kuwait. I return in April 2015 to my wife of 14 years Leigha, my 13 year old daughter Madelyn and my 10 year old son Brayden. 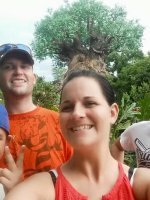 I would really like to take them to Universal Studios in Orlando, FL for a belated Christmas Present and would need 4 FL resident three day park to park tickets. This would be a great surprise for them when I return home and a much needed family vacation with them. Thank you so much for reading. I would be thankful for any tickets, God Bless America! I just first want to say how thankful I was to receive such an incredible vacation! The all inclusive package was more than I expected or could have ever dreamed of. My family and I were overjoyed at the dream vacation all the donors and Vet Tix provided us. Thank you all so very much and god bless you! Hi there, I'm SPC Jason Walker. I'm a former Marine and current Soldier in the Army. 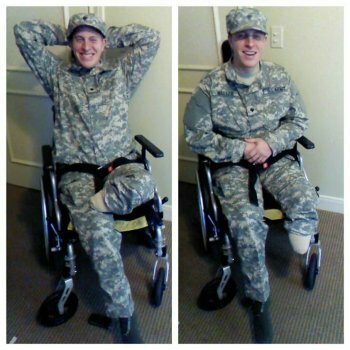 On my third deployment I stepped on a landmine that resulted in the instant amputation of my left leg and my right leg was blown apart. I fought to keep the leg and after 6 months and tons of surgeries I learned to walk again. I've been doing better but my limb salvage has been having increasing problems and on April 22nd I'll be having surgery on it again. This time it may result in the amputation of my right leg above the knee. Before I'm back down for a while I was hoping that I could take my wife and kids to Disney World in Orlando, Fl. I'm requesting 5 four day hopper tickets. 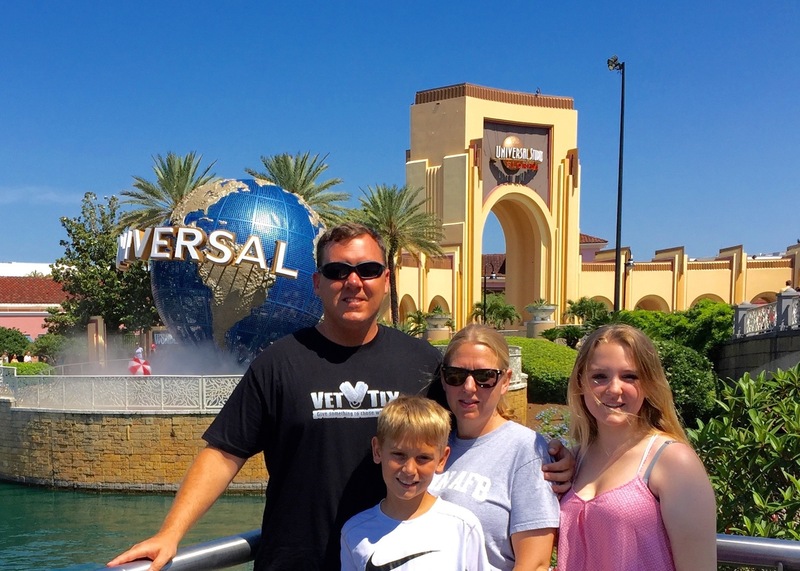 My family has been my life line, and I'd love to allow them a chance to have fun and get away for a few days. They have been the reason I take each step further on my recovery. 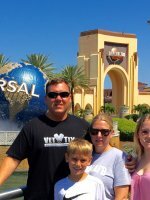 Please help me give my family a memorable vacation, thank you.